Occasionally a game transcends the usual hype train business to become a true event, a shared experience that people talk about for years. For all its changes over time, The Elder Scrolls is an entire series of event games, Bethesda’s self-contained industry of scale-breakingly huge sandbox RPGs. As the long awaited fifth installment, Skyrim is too burdened by old issues for a word as loaded as ‘perfect.’ But there is perfection in the adventure it delivers, which is the distilled essence of everything TES has gotten right over the years. The titular country has seen better days, wracked by a nativist revolt in the wake of a decaying Empire. As is customary among modern TES games, Skyrim‘s customizable protagonist has been imprisoned for unspecified crimes and is coincidentally nearby when big things start happening. By chance you’re sharing a ride to the executioner’s axe with Ulfric Stormcloak, leader of the rebellion and slayer of Skyrim’s king. Just as your turn on the chopping block comes up, a dragon appears out of nowhere and starts wrecking the place. A brief tutorial sequence covers your escape amidst the chaos, and initially you’re given the choice of following the fleeing rebels or a sympathetic (and also fleeing) Imperial. Picking your not-getting-eaten-today buddy is soon the least of your problems, as supposedly extinct dragons are now attacking all over Skyrim. Not to be upstaged, the rebel Stormcloaks are still raring to kick the Empire out. Oh, there’s also a prophecy about all this, and you’re probably it. Better clear your schedule. Ah goody, an inn. I need someplace to practice lockpi… uh, I mean, get some rest. Most of the gameplay hasn’t changed much from Oblivion. You’re still running around an open world in first person (third person optional), questing until you’ve mastered everything while exploring whatever looks interesting. The UI has been reskinned with a minimal HUD and radial menu, which extends to most interaction: conversation, trading, searching containers, etc. The system has good cohesion to it, with the Tab button exiting any menu, even ending a conversation without committing to a response. You can rotate items in your inventory to examine them, which has practical applications in solving certain puzzles. Inventory also has a ‘favorites’ quick-use section, a handy addition to the usual numbered hotkeys. Alas, not everything benefits from this unified approach. Trading lists both the NPC’s and your items on one scrolling list, broken down by category, and it’s a little too easy to buy or sell something on accident. Some need-to-know information is also oddly placed, like active effects (including any diseases) listed in a magic subcategory; a strange holdover from Oblivion made more irritating with the lack of a dedicated stats menu. More substantial are changes to character building, which discards traditional stat allocation and selection of primary skills. You still train yourself in various abilities through use – weapons, stealth, magic, and crafting – but there are no classes and every skill rank counts towards your level. On leveling up you select blanket upgrades to health, mana, or stamina, which can be applied at any time. It’s deceptively simple, though the numbers are assuredly still there. Stamina, for example, governs your carrying capacity alongside the expected stamina pool. Playstyle is more important than stat planning, and it’s all built around picking whatever tickles the fancy and just running with it. You’ll rarely if ever be compelled to grind, particularly if you give in to the ever-present temptation to explore. You may feel this gets eerily close to playing a role of some kind, or “role playing” if you will. For reasons outlined below that feeling will eventually pass, but the system is easy to grasp, deeper than expected, and, most importantly, fun. In any case it’s a definite improvement on Oblivion, even if the lack of attribute control feels like a step too far towards streamlining. Skills and overall balance have seen a lot of attention too. Sufficient training lets you acquire perks for each skill, unlocking damage boosts, improved crafting results, spell overcharging, and so on. It’s a neat modification of Oblivion‘s perks, and not the only area where Fallout‘s favorable influence can be noticed. Skill restrictions are less arbitrary than before, meaning you can take a stab at a master-level lock with minimal training if you feel up to it and have plenty of lockpicks. Zone-based level ranges are used to good effect, where enemies grow stronger with you but have regional lower and upper bounds. There are occasional spikes in difficulty, usually from one boss creature in a dungeon that hits extra hard and requires creativity (or potion abuse) to deal with. Mages can still kite with annoying effectiveness, mitigated somewhat by a slower backpedaling speed. Instant kill animations are a nice touch for certain attacks, though the animation doesn’t always line up properly. As was advertised in previews you can now dual-wield, and in practice your hands are more or less equipped and controlled independently: sword and board, two spells, magic staff and a mace, even two shields if you’re really in the mood for something different. Combat is faster and a lot punchier this time around, with more visceral feedback to weapon and spell strikes. It’s still not where it needs to be for first-person melee, but a power attack actually feels like one when it hits. Better enemy balance in levels helps even the flow of battle, making it easier to survive when a dungeon throws a room full of undead Draugr at you. Other means of conflict resolution have been expanded as well. Sneaking is more dependent on line of sight now, with fewer instances of guards magically knowing your exact location just because you made a noise. And persuasion options have been revised, dropping the speechcraft wheel in favor of more intuitive persuade/intimidate/bribe choices. You won’t be able to talk your way out of every trouble spot, but conversation is definitely deeper than The Elder Scrolls usually allows. Since Morrowind, the series has never lacked for sweeping vistas and attention to detail. 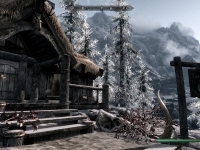 Skyrim sets the tone right off the bat, with the Nordic homeland looking cold and somber for the ride to the executioner. Not long after your escape, the world opens up and you’re met with vibrant forests, crystal clear lakes, and misty, snow-capped mountains; a striking contrast that strengthens the game’s first impression. Beyond ramping up the eye candy, Skryim takes greater efforts to individualize the numerous caves, forts, and ruins you’ll visit. Prefab locations are more frequently customized to feature quests, and usually include at least one unique sight. Long dungeons often loop back to provide quick exits once the quest is finished, which means less pointless backtracking. Character animations seem smoother and transition more naturally than before, though you’ll see certain canned postures too often. It must be contractually mandated that every titled leader in Skyrim sits in the exact same pose. The face-maker still takes a lot of fussing to get right, but default and NPC faces look a lot more like actual people. 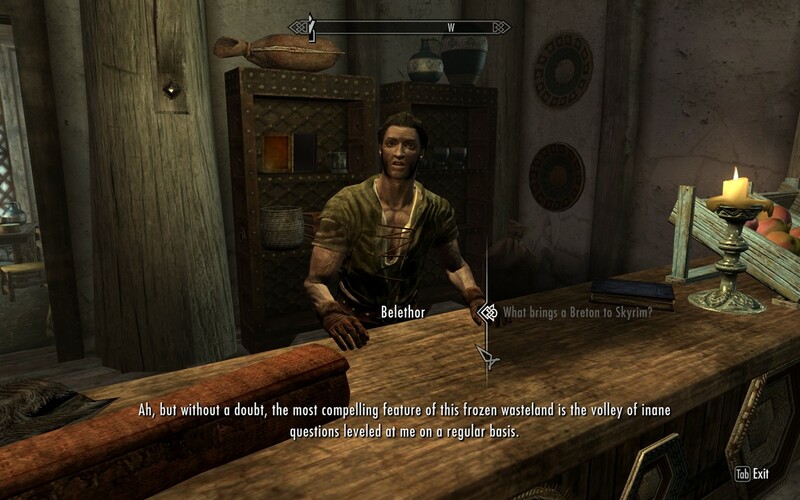 Even in Skyrim, the retail trenches are where hope goes to die. Audio work is also high quality, which is again not a huge surprise given the series. It’s hard to ignore the usual ‘entire race voiced by two people’ problem, though this has become less glaring since Oblivion. Line repetition is a larger issue, as evidenced by the number of city guards being retired adventurers suffering from knee injuries. That said, apart from being quirky parts of the series’ charm, these issues are offset by good voice and script work in the main storyline, less reliant on one mega-star than on several veteran actors. Michael Hogan could yell at people for two hours and I’d probably stick around for the whole thing. Sound effects hit the mark well, but where the audio truly shines is the music. Jeremy Soule has once again composed a lovely score for an epic journey, proving why he’s virtually synonymous with The Elder Scrolls. Tracks from Morrowind are welcome additions, a reminder of that game’s sense of imagination even as Skyrim forges its own world. Forges is the perfect word for it, in fact. 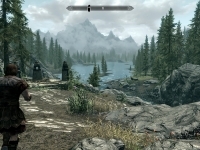 Skyrim is a rugged and dangerous land, with safety and civilization in short supply. Towns might lack the raw diversity of Morrowind, but there’s plenty of character to go around. Whiterun is an early standout, a picturesque medieval fortress-city surrounded by ample farmland and thriving meaderies. 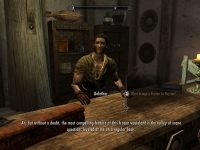 In contrast to the cosmopolitan melting pot of Cyrodiil, the Nords have a tangible sense of culture that pervades every corner of the world: locals who chafe at restrictions on Talos worship, tavern patrons gathering around a performing bard, remnant guerrillas foregoing the use of traditional weaponry, and so on. 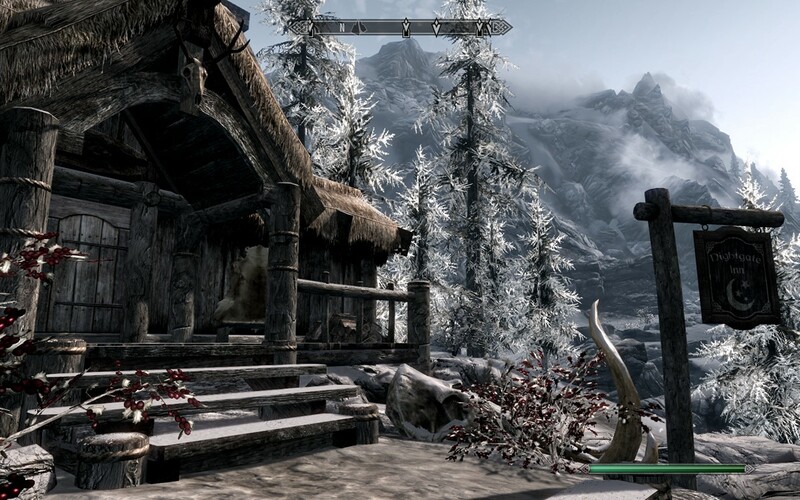 Skyrim manages the rare feat of being familiar and alien at once, with traditional RPG elements spiced up by the Vikingesque flavor of the Nords. Don’t be too surprised if that warrior demands you best her in a fistfight before she’ll take you seriously. From The Elder Scrolls‘ rich, detailed history to Skyrim‘s own well-grounded lore, building worlds remains one of Bethesda’s strong points. For a while, the main story wrings a lot of support from the background. The aforementioned Ulfric killed the king through a legendary power known as Shouting: mystical words that channel the souls of dragons to varying effect. As the prophecized Dragonborn you’ll soon develop this power for yourself, conveniently in time to stop the return of the dragons. Parallel plots are sensibly tied together, from the ongoing civil war to intrigue with the fascist-analogue Thalmor elves. Eventually you’ll fall into the usual “go here, kill that, return with this” rhythm, but the game periodically shakes things up with a big battle or two. Longer sidequests often accommodate solutions they don’t explicitly offer (i.e. killing everyone), while others have multiple choices with no clear good side. Sadly, some quests skew criminally in the opposite direction. In one poorly-signposted instance you’re forced to kill someone simply after following him into an abandoned house, even if you have the means to pacify them magically. Your quest log will also fill up with FedEx/Assassin fluff fast, regardless of whether you agreed to any of them. Traditional Bethesda problems are more prevalent. As usual, any character can become master of every guild, which rather mutes the effect of rising to the top. Some factions require little in the way of dedicated skills, such that becoming a bard just means hunting down old poetry and instruments; more adventuring, which you were doing anyway. Glitches are common and several issues are still being patched out, the PS3 memory size crash among the more egregious ones. Thankfully, no such issue was encountered on the PC. Dragons are initially menacing but quickly lose their teeth outside select battles, becoming little more than really persistent cliff racers. Should one touch down in a busy street, it is often quickly swarmed by a mob of guards and armed peasants. In one case this included a 70-year-old man – naked, for some reason – who kept trying to punch it to death. Longer, combat-heavy dungeons can get tedious if you don’t mix up your approach, though spamming the same attacks over and over is typically more expedient. AI pathfinding can also be filed under “needs improvement,” with NPCs still unable to jump a foot-high obstacle to save their lives. Such is the game’s overall strength that these problems are easy to overlook. Whatever their faults, TES games have always excelled at delivering a grand adventure, and Skyrim is no exception. The scripted side of things has gotten better, with a world that more actively reinforces the conflicts at hand. There are also semi-random events, like someone hiring mercenaries to ambush you because you sided with their enemy in a quest. Regrettably, I saw no option to confront them about this. However, it’s the stuff between scripted moments that’s likely to stick with a player: that ruin you snuck through without being detected, or that one determined bandit who nearly killed you until you lured him into his own traps, or that time when a dragon dropped down on a pack of Forsworn you were battling. Open worlds lend themselves to crazy, unexpected things, and Skyrim, like its predecessors, knows how to take advantage of this. Seriously, Skyrim is a really pretty game. Even simple wandering has an appeal to it. You’ll hear something scampering through the snowy forest alongside you, only to find a harmless deer when you turn and nock an arrow. You’ll fight your way through blinding rain at night as you creep up on an old fortification, where fires are burning and bandits are guarding the towers. You’ll pore over an ancient combination lock, messing with the dials until you think to take a closer look at that dragon claw statue; an enjoyable old-school puzzle that calls back to point-and-click adventure games. 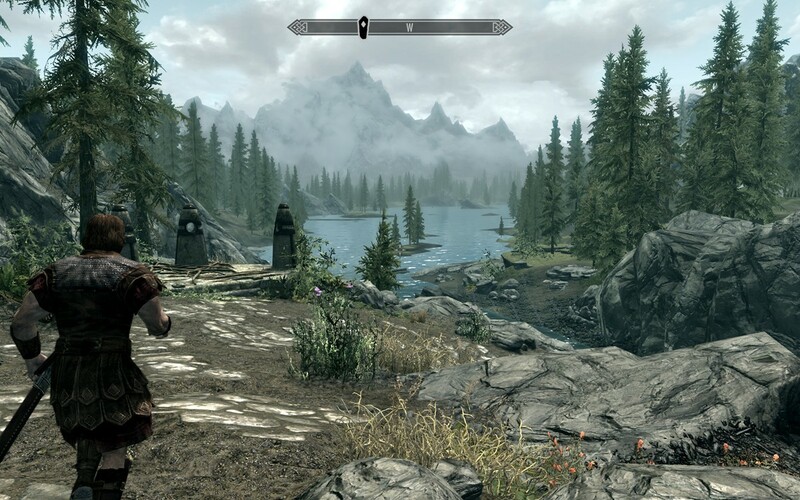 Skyrim is unquestionably a beautiful world filled with interesting places, and anyone familiar with Map Marker Compulsion will feel the draw when they see something new on the compass. Several towns seem far too small – it’s baffling that the mostly-destroyed Winterhold, with more guards than named citizens, still has a Jarl – but the overall adventure is rich with content, well paced, and sometimes downright intelligent. It certainly gets gamey at times, but there are moments where you’ll feel part of something greater. All this content naturally adds to the clock, and finding everything there is to find requires a time investment better measured in weeks rather than hours. Skyrim is huge to the extent that people have actually discussed, in partial jest, how it could hurt the economy. Sticking to business cuts down on that considerably, and one could hit the important parts of the main plot in 30-40 hours; less if you’re serious about cutting every last corner. Naturally, the game keeps going when you’re done with the plot, which is handy if you want to really impress someone before asking if they have any odd jobs that need doing. The Stormcloaks/Empire choice gives a decent incentive for at least a second playthrough, as if the size of the game and flexibility of character development wouldn’t encourage that on their own. Though Skyrim doesn’t completely escape the usual free-roaming RPG problems, it surpasses its predecessors in being accessible and has not lost its soul in the process. It’s an adventure virtually unmatched in scale and wonder, where how you get from A to B matters more than what happens there. Though the narrative doesn’t break any new ground, it’s competently told and the atmosphere is strong enough to stand on its own. Even the sillier bits feel more like intentional jokes, the product of a team unafraid to poke fun at themselves. It’s hard not to laugh at a guard talking about curved swords as if the very concept is mind-blowing to him, and a familiar Daedric prince adds a welcome dash of craziness in a brief guest appearance. In saner matters, while you’re subtly encouraged to do everything you can, you’ll still find yourself doing things your own way. If you’re new to The Elder Scrolls or sandbox RPGs in general, Skyrim is an excellent starting point. If you’ve been down this road before and enjoyed it, from Morrowind to the Mojave, you’ll lose entire weekends to this beast and not regret it for a moment. Big budget games come and go, but the classics stay with a person, and Skyrim is classic straight to the core. It’s not perfect, but Bethesda is getting closer with every game. By all means, pick this up and see what all the Fus Ro Dah is about. This game was played to completion with a digital download copy purchased through Steam.